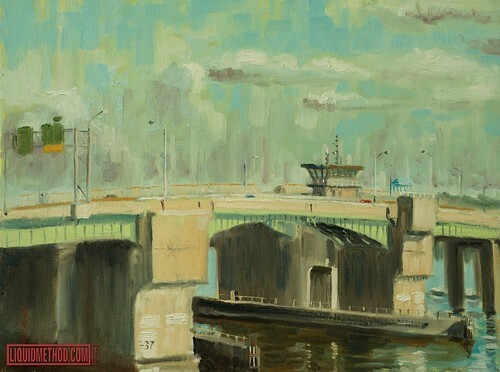 New Painting: "Berkeley Bridge" in Downtown Norfolk Waterside Plein Air : Oil on Board : 16x20". New Painting: "Berkeley Bridge" in Downtown Norfolk Waterside Plein Air : Oil on Board : 16x20"., originally uploaded by Liquidmethod. Tough painting the sky, it was cloudy overcast one minute and sunny and blue sky the next. You can guess that I painted the sky first. Reflecting back, this was a much more complicated subject than the Lesner Bridge plein air from a few weeks ago. Funny thing was, my son knew exactly which bridge it was and knew exactly what the green exit signs said. He's a amazing when it comes to maps and locations, photographic memory. My wife likes to call him our personal GPS.